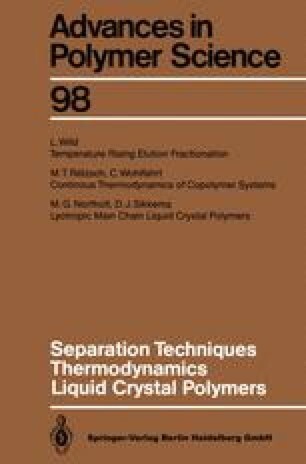 Continuous thermodynamics provides a simple way for the thermodynamic treatment of polydisperse systems. Such systems consist of a very large number of similar species whose composition is described not by the mole fractions of the individual components but by continuous distribution functions. For copolymers, multivariate distribution functions have to be used for describing the dependence of thermodynamic behavior on molar mass, chemical composition, sequence length, branching, etc. In this paper, we review continuous thermodynamics as applied to copolymer systems. Special attention is focused on liquid-liquid equilibria and thermodynamic stability. Equilibria in solutions of random copolymers, blends of random copolymers with homo- or copolymers, and also the high pressure phase equilibrium in the mixture of copoly(ethene vinylacetate) with its monomers are also discussed. A special examination of polydispersity effects in solutions with block copolymers is made. Thus, the paper reviews in a comprehensive way how to build up continuous thermodynamics with multivariate distribution functions and how to derive relations necessary for solving special problems. Some short remarks on possible future prospects will round up the paper.